Nick Foles of the Eagles reacting in the fourth quarter against the Patriots. Nick Foles, native Austinite and Westlake High School grad, played college football in Arizona before he was drafted by the Eagles in 2012. One of Austin’s own led the Philadelphia Eagles to victory in this year’s Super Bowl, earning him the title of the Super Bowl's Most Valuable Player. Nick Foles started this season as a backup quarterback, and he ended it as Super Bowl MVP. Foles threw for 373 yards and three touchdowns, with one interception (that was not his fault) and also caught a touchdown in the Eagles upset win. In what can best be described as a nail-biting game, the 2018 Super Bowl ended with a score of 41-33 with the Eagles on top. After the Patriots took their first lead of the game, at 33-32 with 9:22 remaining, the Eagles could have wilted. But Foles led the Eagles on a 14-play, 75 yard touchdown drive to retake the lead with 2:21 remaining on an 11-yard pass from Foles to tight end Zach Ertz. The drive included a fourth-down conversion near midfield, also on a pass from Foles to Ertz. Foles, a native Austinite and Westlake High School grad, played college football in Arizona before he was drafted by the Eagles in 2012. Before Foles graduated from Westlake High in 2007, he played quarterback on the school’s football team. 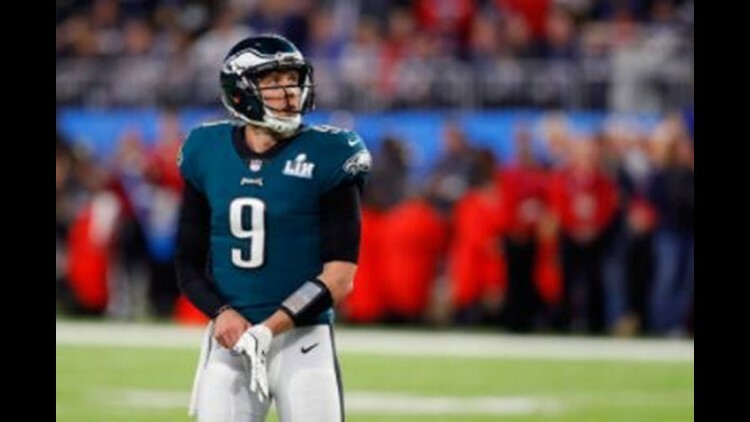 "I think the most I remember about Nick was how competitive he was and also what a leader he became that year,” said Steve Ramsey, Foles’ former offensive coach. Ramsey is now Westlake High’s principal. The week prior to the big game, shirts bearing Foles’ name and image were sold at the school. The shirts were designed by Foles’ mother and benefit the Chaparral Club and the Longhorn Paralysis Foundation. They feature Westlake’s logo on the front, Nick Foles on the back.